Martin Shkreli finally goes to jail! Photos of the “Pharma Bro’s” perp walk populated many of our facebook feeds in celebration of this unscrupulous capitalist finally getting his just desserts. This is reason for celebration, right? Well, sort of. The real crime that brought Mark Shkreli into the public limelight was his price-gouging of Daraprim, a drug used to treat toxoplasmosis in patients with AIDS. He had recently purchased the intellectual property rights to Daraprim and therefore controlled the production and sale of the drug. He proceeded to increase the price of the drug by 5000%. His justification? Similar life-saving medications used during cancer treatments cost more than Daraprim did, so the drug was “undervalued” in the market– so he felt justified in charging 5000% more for the drug, bringing it more in line with other overpriced medications. Heartless price gouging on life-saving medication is not, however, what Shkreli is going to serve time over. Shkreli is going to jail over charges of fraud, a crime only tangentially related to the moral crimes he committed. The moral crime he is now famous for –holding sick and dying people hostage for as much money as possible– remains perfectly legal. 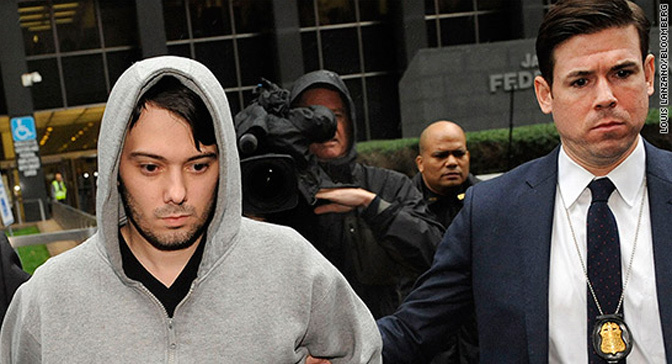 Daraprim remains overpriced. As do most all live-saving medications with privately held patents. The crime that he is going to jail for is stealing from rich people and lying about it, not stealing from sick people and being honest about it. But I think it’s more than that. Because Shkreli, in his interviews, and with his twitter handle, so nakedly displayed the amorality and lack of interest in human life so central to the operation of capitalism, he became a public relations problem for the ruling class. When Shkreli became the face of capitalism, I’m sure his fellow capitalists decided that he would have to go, so the masses could feel that the system still works — that “bad capitalists” go to jail, and therefore the rest are “good capitalists” and operate ethical businesses and donate to charity or whatever. That is not the case. The worst of his crimes are not only still perfectly legal, but are central to the operation of the capitalist economy. So celebrate his perp walk, sure, but keep in mind what he’s actually going to jail for, and what he isn’t. Asher Platts is a contributing Author at PunkPatriot.com and 2012 and 2014 candidate for State Senate with the Maine Green Independent Party.